For the last several months, I've been trying to figure out what to do with a material I love: Dichroic film. It's a vinyl film with an adhesive back and it's usually used on panels of clear plexiglas for interesting effects. I had a few pieces of clear plex and some of the film, so I applied the film to one side of the plex and experimented with applying paint to it, resin to it, ink to it...just to see what happened. "What were you thinking you'd do with it?" you ask. Well, I was asking that same question. I had no idea what I wanted to do with it, I just really wanted to play with it. Then I came up with an legit experiment...which would not be cheap (dichroic film is seriously expensive) but I got the okay from Joy so...I ordered a couple yards of the material. What I ended up doing was creating two paintings the panels of which were built angled toward each other (not parallel to the wall) and I created my painting on that angled surface. I built it up with texture, covered the texture with Italian aluminum leaf, oil paint and resin. Then...I covered the surface with the dichroic film. Then I was outside with the pieces and it started to rain. When I got back into my studio, there were big rain drops all over the surface of my cool paintings. I thought they were ruined except now...who'd have guessed? The rain drops amplified the coloration of the dichroic film, creating little circular puddles of rainbow light everywhere they rested on the surface. So that effect was too cool to pass up playing with so...I dried off the surface of the panels and dropped bits of resin all over the surface of each panel. When the resin cured, I had permanent "rain drops" on the surface of my paintings. The effect was cool. And then I posted photos on Facebook and waited for some opinions. Putting together the honest input of friends, I realized I was working with a material that was indeed cool and worth experimenting with, but that the way I was using it was entirely overkill. It's like someone getting all excited about inventing vanilla extract and then trying to convince you that it was amazing and you really need to take a big gulp of it. That would end in disaster, as did my art experiment. Vanilla extract (like dichroic film) is very, very potent. You only need a small bit to make a huge impact. So it's back to the drawing board. I'm going to do something with this stuff. And I've got some ideas! Winston Churchill once said, "“Success is the ability to go from failure to failure without losing your enthusiasm.” Thank you Winston. I am undaunted. Over the last several days, I've been preparing for our spring Studio Stroll. This is an even that happens this weekend in Asheville's River Arts District and also in the fall and is immensely popular (mostly with locals who spend this time checking in with all their favorite artists). It used to be the studio stroll meant that for two weekends every year, all the art studios were open to the public and could be visited by, well, by anybody. I don't know how long it went along like that but eventually, some enterprising artist decided to open their art studio to the general public more often than just twice a year, and guess what? People visited their studios. Eventually, artists began to adopt the "open studio" business model and banded together and started advertising that they were here and open to visitors. And so nowadays, people can visit over 200 artists within about a one square mile area and have a good chance of walking in on some artwork actually in the process of being worked on. And because Asheville became known for this business model, I can make a living here doing artwork and greeting visitors from literally all over the country (and other countries). So what is the studio stroll like for an artist? That kind of depends on the artist. I love it but it's really exhausting. Imagine being asked by about 2000 people throughout the two days, "hey, why are these paintings so shiny?" "How do you do this?" "Do you really make a living just doing this?" (I love that last question! Ha!) It's honestly great fun talking to so many people who are visiting our studios because they love artwork (so we have something in common right from the start). The first couple studio strolls I did I just sat there all day long and greeted people, but not doing anything but sitting there was unbearably boring, so...now I have several canvases ready for the aluminum leaf application (people like watching that) and I will be working on my "Big Mama" 8' x 10' painting when I get tired of the aluminum application. So if you're in Asheville or close-ish, please know you're invited by all 200+ artists to pay us a visit. There are free trolleys both Saturday and Sunday. We're ready for you. Spring is one of the big reasons we enjoy living in Western North Carolina. Asheville is amazing this time of year. Visitors begin besieging the Biltmore Estate to see the tulips and daffodils and tourists are beginning to swarm downtown Asheville, creating a congenial commotion as they wander around our streets, shops, restaurants and art galleries. Ahhhh. I love this time of year. Growing up in southern California, spring and autumn were pretty much just "theoretical" seasons. But the character of Asheville and all of western North Carolina completely changes with the turning of the gentle seasons. Joy and I are working in earnest this time of year, finishing up winter projects while there's still time, building up our inventory of oil paintings so we are ready for a new summer season. So plan a trip! And when you visit Asheville, stop into St.Claire Art studio in the River Arts District and see what we're up to. There are more than 200 artists here and we will happily part with a map to keep you from getting lost! The weary steps of woe? Has scorch'd my fountains dry. My youth and joy consume. Made me the thrall o' care. So Peggy ne'er I'd known! The wretch whase doom is, "hope nae mair,"
What tongue his woes can tell! "Can you really make a living here?" 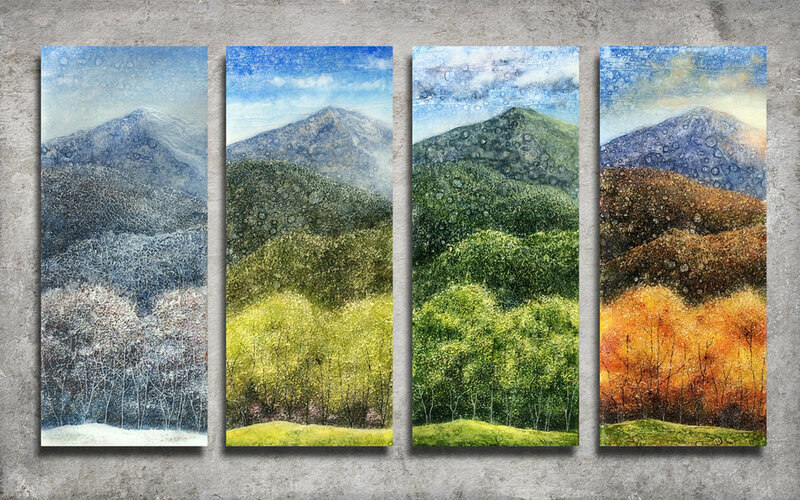 People often ask if it really is possible to make a living as an artist here in Asheville. I answer an appreciative "YES". And there are reasons for that. Asheville is unique. We have within a square mail, over 200 artists with open doors to the public. It's awesome. And because our artists association has done some really great advertising, people from all over the country come through our doors. I don't know many artists here at all that do the art show circuit. We just really don't have to. People come to us. The French Broad River, in whose basin the River Arts District resides, is the third oldest river in the world. In 1880, when the railroad first came thru Asheville, our population was around 500 people. By 1900, Asheville boasted 10,000 residents. This boom town reality continued until 1929, when The Great Depression settled in for a long winter's nap. Asheville's River Arts District "woke up" around 1985 and has been evolving for the past 27 years. A group of dedicated artists, landowners & businesses have laid claim to a neglected area of Asheville's riverfront and are calling it home. The first arts based business to locate in what is now the River Arts District was Highwater Clays. They moved from Biltmore Village in 1985, to the current home of Gennett Lumber. In 1987, Porge & Lewis Buck were the first artists to actually buy a building in the Asheville RAD, which they named Warehouse Studios. The early 1990's saw a migration of artists out of downtown into what was the Chesterfield Mill. The first Studio Stroll took place in 1994 and included such notable artists as Kevin Hogan & Cathy Triplett. In 1995, the Chesterfield Mill was consumed by fire, as was most of the old Cotton Mill. One of the remnants of the Cotton Mill was renovated into more live/work studio spaces in 1996 & in 2003, purchased by Marty & Eileen Black & renamed Cotton Mill Studios. Flood waters are thought to bring good nutrition to the earth they inundate. The combined floodwaters of Hurricanes Francis and Ivan in 2004 had the unintended consequence of destroying the Home Cooking Cafe, which inadvertently made room for 12 Bones Smokehouse (2005). The flood waters also prompted CURVE studios & garden to focus on retail/studios in the ground floor studios... creating the model of studio/showroom that has become a viable economic development tool for the Asheville RAD. In 2004,Asheville’s Chamber of Commerce to begin using the name "River Arts District". This began a five year branding process that has culminated in 2010 with the "River District Artists" changing their name to the "River Arts District Artists" and the new wayfinding program which incorporates numerous directional signs showing visitors how to find their way down to the River Arts District. 2010 saw an amazing influx of new buildings to the River Arts District starting with Pink Dog Creative @ 342 Depot Street. Randy Shull & Hedy Fischer's "baby" has continued a renaissance on Depot Street that was started by Ray Quate with his 2005 renovation of 352 Depot. Mountain Housing Opportunities has contributed the great vision of Cindy Week's $10 million dollar Leeds certified affordable housing project, the Glen Rock Depot. David C. Stewart & David Frechter transformed the old Southern Depot Nightclub into David C. Stewart's painting studio on the first floor and home to Nourish & Flourish, a Network Care Provider as well as Nia Movement Studio & Fresh Juice & Tea House. In 2011, Wendy Whitson established Northlight Studios @ 357 Depot Street, providing 4 new studios & Asheville Greenworks. John & Liana Bryant renovated The Hatchery Studios at the north end of the River Arts District with 5 new studios that include a pottery co-op & the fine art studios of Kirsten Stolle & Court McCracken & Art Nurture Asheville as well as White Duck Taco Shop, brain child of Ben Mixson & Laura Reuss. Daniel McClendon has renovated 349 Depot Street into The Lift Studios, home of Daniel McClendon Fine Art. All these new buildings are making room for some wonderful independently owned "Asheville Grown" businesses. The Wedge Brewery, founded in 2008, thanks to the vision of Tim Schaller & the late John Payne has made the River Arts District fun every night of the week. One of the little known and unsung heroes of the River Arts District is a business man named Bill Goacher. Many years back he acquired a number of properties, in what is now the ARAD, simply as a business investment. The brilliance of his vision has always been bright but his approach, very low key. Mr. Goacher rented spaces to artists, at very affordable rental rates, and when a good steward of his buildings showed interest in their purchase, he selectively said yes. The Wedge Studios, founded by John Payne in early 2001, is one of those buildings where Bill Goacher said yes. In 2012, The Wedge was sold again, this time to a consortium of 8 local guys who like to drink beer there and is transforming once again with a new restaurant track side by the owners of The Admiral fame called The Bull & Beggar. Perhaps the biggest news in 2012 was the announcement that New Belgium Brewery selected the old WNC Stockyard & Bell's Mini Storage sites on Craven Street, for the location of their $175 million dollar East Coast Brewery. Demolition has begun in early 2013. NBB expects to be serving beer from it "Liquid Center" in early 2015. This new manufacturer will bring over 100 new jobs & tens of thousands of visitors to the west side door of the ARAD. As life is never static here in the ARAD, 2013 finds a number of new buildings coming on line. Tannery Studios & Switchyard Studios are now open @ 339 Old Lyman Street behind Riverview Station. Galaxy Studios has opened on the north end of the ARAD @ 161 West Haywood Road & Heather Knight of Element Clay Studios has moved over to 362 Depot Street. White Duck Taco has opened Pizza Pura @ Pink Dog Creative to go along with new galleries for William Henry Price, Studio A and The Paintbox. And then, near the end of 2015, something magical happened...The Paintbox moved from Suite 104 in the Pink Dog Creative building and I moved in and this has been my creative home since then. Learn more about the River Arts District.